Discussion in 'Articles' started by Trickman, Jul 9, 2014. Fighting game aficionados and fans rejoice! 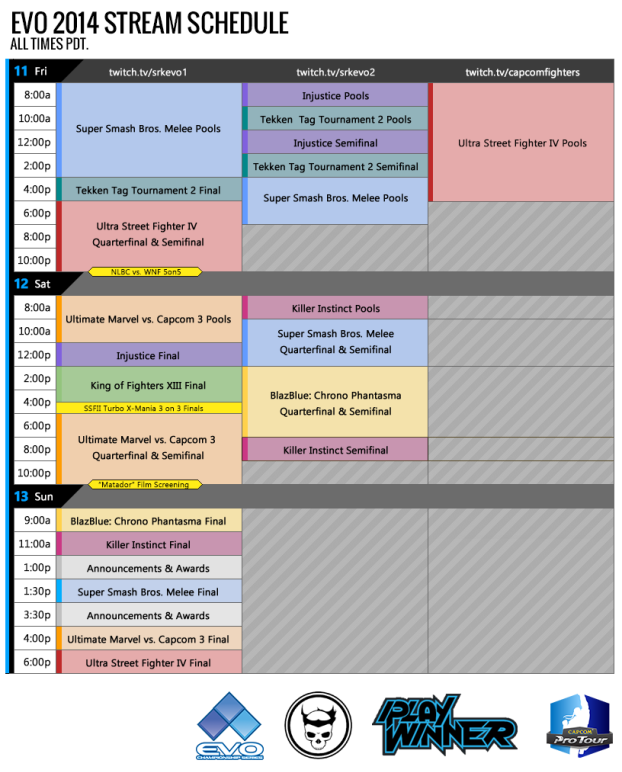 Evo 2014 begins this coming Friday, July 11th and lasts through Sunday, July 13th. The Evolution Championship Series (Evo for short) represents the largest and longest-running fighting game tournaments in the world. Evo brings together the best of the best from around the world in a dazzling exhibition of skill and fun, as players and fans gather to honor the competitive spirit in an open format and determine a champion. Starting this Friday, you will be able to watch three game play streams of the event, conveniently located right here on the VGEvo front page. The teaming on http://twitch.tv/srkevo1 and http://twitch.tv/srkevo2. The Capcom Pro Tour will broadcast all of the Ultra Street Fighter IV pools from their channel at http://twitch.tv/capcomfighters. The full schedule is located HERE. Note: These are Pacific times (PDT). Which fighting game tournaments will you be watching this weekend? Randum, Boric and Paul like this. I'm excited for EVO but I don't know how much I'll get to watch this year. I'll be watching Marvel and most likely Ultra SF4. Definitely will be watching Ultra SF4 and Smash as much as I can, Hopefully MvC3 as well. And I'll probably try to pop in on some of the others.